The survival and prosperity of any corporation over the long term depend on the company’s ability to grow and develop through a process of investment, restructuring, and redeployment. Since the late 19th century, mergers and acquisitions (M&As) have become an essential vehicle for corporate change, fuelled by synergies that could arise from expansion of sales and earnings, reduction in cost, and lower taxes and cost of capital. M&A transactions, however, are complex and risky and are affected by the state business cycle, financial conditions, regulations, and technology. Approximately two-thirds of all M&A deals fail. This book seeks to provide an effective and comprehensive framework, predominantly embedded in corporate finance, for achieving greater success. 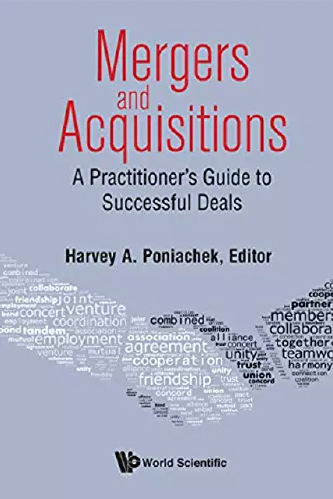 Written by academics and practitioners, it integrates business strategies with formal analysis relating to M&A deal-making, providing a coherent statement on M&A by utilizing scholarly work with best practices by industry. The authors provide extensive analytical review and applications of the following critical M&A issues: valuation, leveraged buyouts, payment methods and their implications, tax issues, corporate governance, and the regulatory environment, including antitrust in M&A. The book globalizes the M&A model by extending it to cross-border business, risk and select hedging methods, and addresses postmerger integration. This book is intended as a reading text for a course in M&A for undergraduates and MBA programs, and for practitioners as a handbook.